This is class for nodes representing the (SBML) delay function. Definition at line 28 of file CEvaluationNodeDelay.h. Definition at line 34 of file CEvaluationNodeDelay.h. Definition at line 24 of file CEvaluationNodeDelay.cpp. Definition at line 30 of file CEvaluationNodeDelay.cpp. 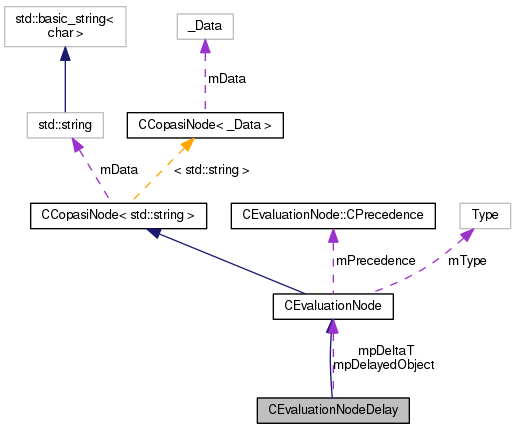 References DELAY, fatalError, CEvaluationNode::mPrecedence, CEvaluationNode::mValue, and PRECEDENCE_FUNCTION. Definition at line 50 of file CEvaluationNodeDelay.cpp. Definition at line 56 of file CEvaluationNodeDelay.cpp. Definition at line 58 of file CEvaluationNodeDelay.cpp. References DELAY, CCopasiNode< std::string >::getChild(), CCopasiNode< _Data >::getSibling(), mpDelayedObject, mpDeltaT, and CEvaluationNode::mType. Definition at line 169 of file CEvaluationNodeDelay.cpp. References CCopasiNode< _Data >::addChild(), CEvaluationNodeDelay(), CEvaluationNode::compile(), DELAY, and CEvaluationNode::subType(). Definition at line 137 of file CEvaluationNodeDelay.cpp. 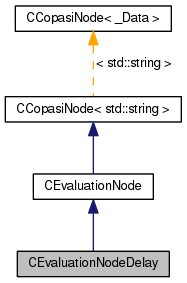 References DELAY, CCopasiNode< std::string >::mData, and CEvaluationNode::mType. Definition at line 121 of file CEvaluationNodeDelay.cpp. Definition at line 105 of file CEvaluationNodeDelay.cpp. Definition at line 86 of file CEvaluationNodeDelay.cpp. References compile(), DELAY, CCopasiNode< std::string >::mData, and CEvaluationNode::mType. Definition at line 206 of file CEvaluationNodeDelay.cpp. Definition at line 153 of file CEvaluationNodeDelay.cpp. Create a new ASTNode corresponding to this delay node. Definition at line 189 of file CEvaluationNodeDelay.cpp. References CCopasiNode< _Data >::addChild(), CCopasiNode< std::string >::getChild(), CCopasiNode< _Data >::getSibling(), and CEvaluationNode::toAST(). Definition at line 132 of file CEvaluationNodeDelay.h. Definition at line 133 of file CEvaluationNodeDelay.h.